The essence of science is figuring out what things are made of, and how things work. 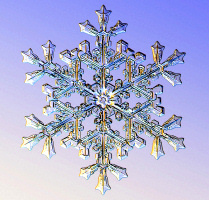 This page gives just a brief introduction to the science of snowflakes. Delving deeper brings one into a fascinating, and still unfolding, story about the molecular dynamics of how crystals grow and develop. For that you can browse the Contents page, and from there jump to a wide variety of topics relating to snowflake science. When people say snowflake, they often mean snow crystal. The latter is a single crystal of ice, within which the water molecules are all lined up in a precise hexagonal array. 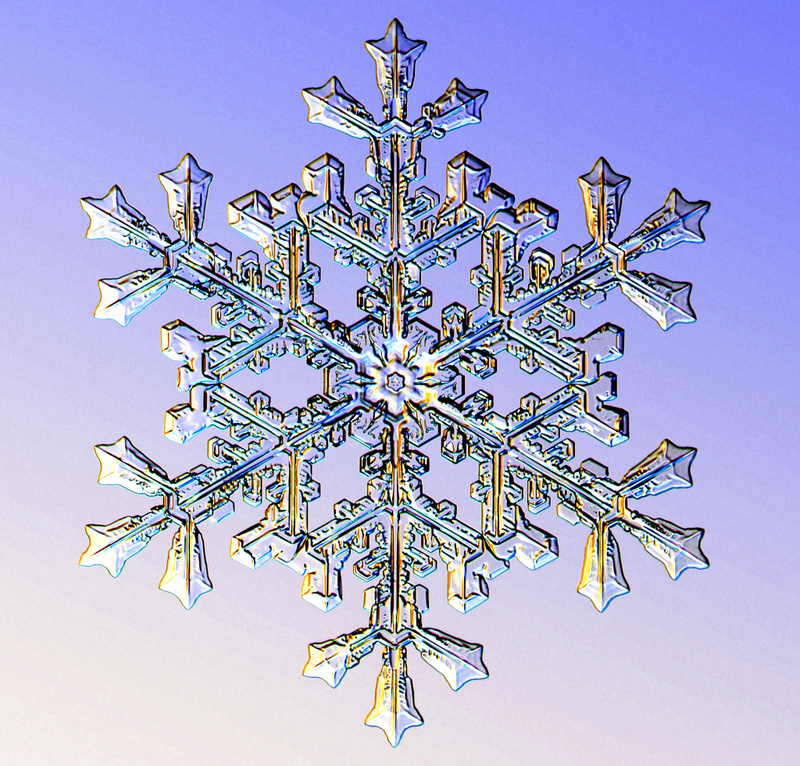 Snow crystals display that characteristic six-fold symmetry we are all familiar with. The picture on the left shows a snow crystal. A snowflake, on the other hand, is a more general term. It can mean an individual snow crystal, but it can also mean just about anything that falls from the winter clouds. Often hundreds or even thousands of snow crystals collide and stick together in mid-air as they fall, forming flimsy puff-balls we call snowflakes. Calling a snow crystal a snowflake is fine, like calling a tulip a flower. Snow crystals are not frozen raindrops; that is called sleet. A snow crystal appears when water vapor in the air converts directly into ice without first becoming liquid water. As more water vapor condenses onto a nascent snow crystal, it grow and develops, and that is when its ornate patterns emerge. Why such complex, symmetrical shapes? And why are no two alike? 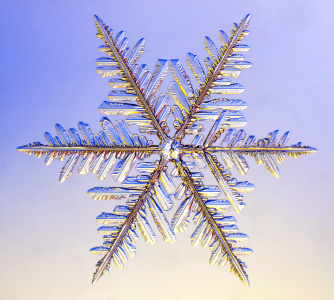 A stellar snow crystal begins with the formation of a small hexagonal plate, and branches sprout from the six corners when the crystal grows larger. As it tumbles through the clouds, the crystal experiences ever changing temperatures and humidities, and each change makes the arms grow a bit differently. The exact shape of the final snow crystal is determined by the precise path it took through the clouds. But the six arms all took the same path, and so each experienced the same changes at the same times. Thus the six arms grow in synchrony, yielding a complex, yet symmetrical shape. And since no two snow crystals follow the exact same path through the clouds as they fall, no two look exactly alike. We have made "identical-twin" snowflakes by exposing a pair of tiny seed crystals to nearly identical varying conditions as a function of time. This shows essentially what would happen if two snow crystals traveled side-by-side as they fell from the clouds. What synchronizes the growth of the arms? Nothing. The six arms of a snow crystal all grow independently, as described in the previous section. But since they grow under the same randomly changing conditions, all six end up with similar shapes. There are no mysterious forces -- quantum-mechanical, acoustical, or anything else you might have heard about -- that provide communication between the arms to ensure they all grow alike. One analogy I like is what happens on a rainy day. You look outside, see that it is raining, so you grab your umbrella on your way out. Then you find out that your neighbors are all carrying umbrellas too. You didn't communicate with one another about this, yet everyone's umbrella usage was synchronized. The same goes for the six branches of a snow crystal. When the temperature or humidity changes around the crystal, the six branches all change their growth in snychrony, even though the branches do not communicate with one another. Now, let me assure you that the vast majority of snow crystals are not very symmetrical. 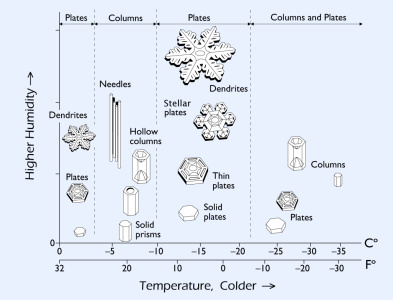 Don't be fooled by the pictures -- irregular crystals (see the Guide to Snowflakes) are by far the most common type. Just take a look for yourself next time it snows. Near-perfect, symmetrical snow crystals are fun to look at, and sought after by photographers, but they are not common. 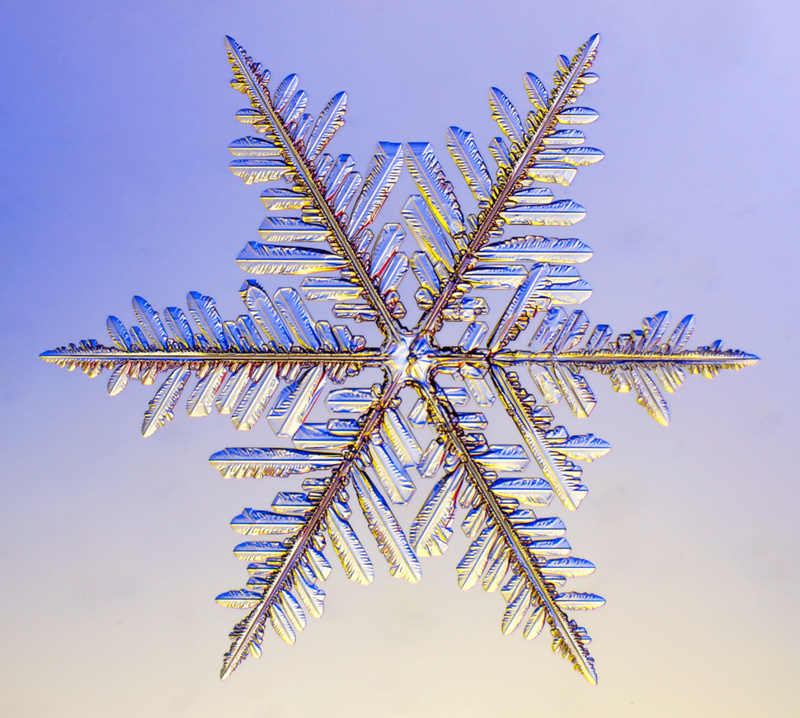 The six-fold symmetry you see in a snow crystal arises from the arrangement of water molecules in the ice crystal lattice. As this ice crystal model spins around, you can see the hexagons in the structure. But a crystal is a three-dimensional structure, and snowflakes are also three-dimensional. 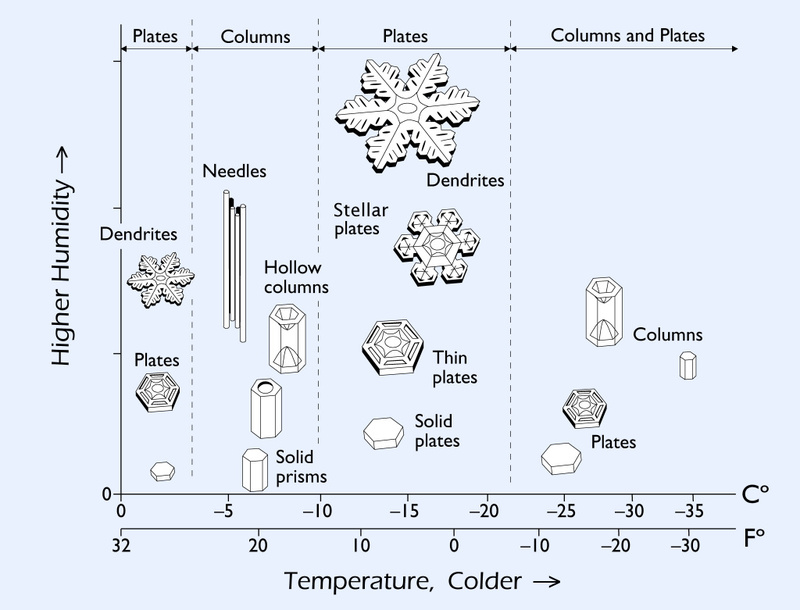 Stellar plates are thin and flat (see the Guide to Snowflakes), but other snow crystals are not. 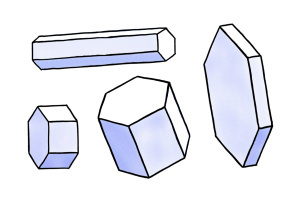 When snow crystals first begin growing, they are shaped like the simple hexagonal prisms shown here. 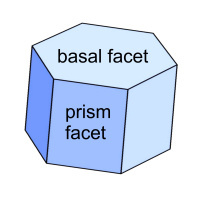 Each prism has two basal facets and six prism facets. Hexagonal prisms can be long, slender, hexagonal columns, or thin, flat, hexagonal plates, or anything in between. Hexagonal prisms display the simple, perfect order of the molecular lattice. These crystals result from slow growth, and they are usually small in size. If you take a close look at the snow crystal on the left, you will see that it is not very symmetrical. Sure it has six similar branches, but the sidebranches are randomly positioned on the each of the branches. This is a fernlike stellar dendrite (see the Guide to Snowflakes), and each branch grows independently of the others. Plus each branch grows rapidly (compared to other snowflake types), sending out sidebranches at irregular intervals. The chaotic branching of a fernlike stellar dendrite arises during rapid ice growth, in contrast to the slow, simple growth of hexagonal prisms. There is no blueprint or genetic code that guides the growth of a snowflake. Yet they appear in these amazingly ornate, symmetrical shapes. The shape of each crystal is not determined by any plan or predetermined design, but by different processes that govern its growth behavior. Faceting. One such process is faceting, which causes flat surfaces to appear on the crystal, surfaces that reflect the underlying molecular symmetry. Click on the link to read more about faceting. Branching. This process causes complex structures to grow out from the ice. Click on the link to read more. Sharpening. This process pushes snow crystal growth to thin, flat plates, happening mainly at temperatures near -15C (5 F). The different growth processes guide snow crystal growth differently. Faceting creates order, as embodied by the simple, perfect, hexagonal prism. Branching brings chaos, as embodied by the randomly spaced sidebranches in a fernlike stellar dendrite. But with the right mix of order and chaos, nature sometimes creates beautiful snow crystals that are both complex and symmetrical. 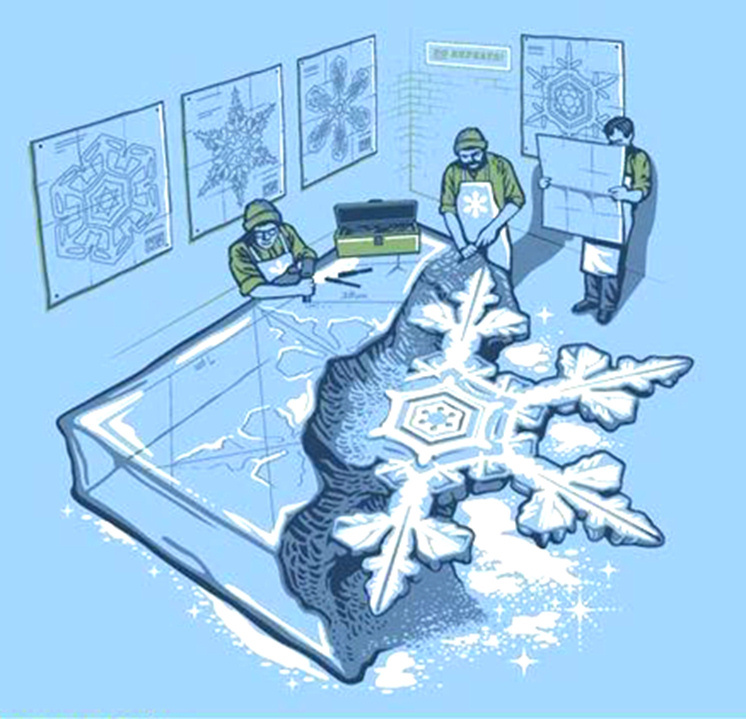 As you learn more about snowflakes, you soon find that the underlying science is quite complicated. The growth of a snowflake depends on how water molecules diffuse through the air surrounding a growing crystal, and it depends on how water molecules stick to ice surfaces. There is a lot going on as these crystals form in the clouds. Of course, that is what makes it all so fascinating! The way snow crystals grow depends strongly on the temperature and humidity in the clouds. This is summarized in the Snow Crystal Morphology Diagram shown on the right. This is also called the Nakaya Diagram, after Japanese physicist Ukichiro Nakaya, who discovered this behavior by growing snow crystals in his lab in the 1930s. Go ahead, click on the diagram for a closer look. It shows that the largest, most photogenic stellar snow crystals only grow in a narrow temperature range around -15 C (5 F). Needles and columns are best found around -6 C (21 F). Capped columns appear when the temperature changes as the crystals grow. Remember these are temperatures in the clouds; it is often substantially warmer on the ground. You can also see that more elaborate, branched crystals grow when the humidity is high. Simple prisms grow when the humidity is low (or when the crystals are tiny). Exactly why snow crystals grow this way is not yet fully understood, although much progress has been made. The growth behavior of ice depends on the molecular structure and dynamics at the crystal surface, and this is all so complicated that no one really understands everything about it. Although science has made great advances in understanding the secrets of the Universe, there remains a bit of mystery still in these remarkable ice structures. 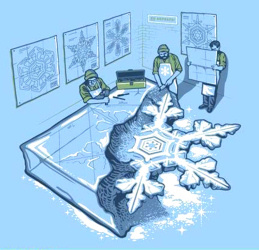 If you find this intriguing so far, please continue to the Contents page, from where you can jump to a wide variety of topics relating to snowflake science.